good thing it’s wearing its PaddlePak! From the amazing makers of the Trunki Ride-on suite case, England’s innovative children’s product designer Trunki take the plunge this month in the U.S. with their PaddlePak, the backpack for little explorers. 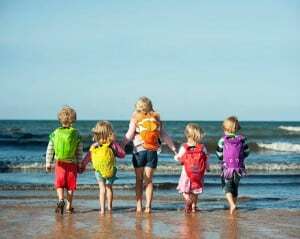 PaddlePak is a water resistant backpack for children ages 2+. It prevents damp items from leaking through after trips to the pool or beach, or keeps contents inside dry throughout any trip. Made from lightweight and durable material, PaddlePak with its ingenious roll top seal uses the same innovative technology as adult outdoor bags. It features a patent pending break-away safety buckle, reflective trim, the Trunki grip™ to keep sunglasses or goggles close to hand, and a tail fin that doubles as a functional pocket for small valuables. PaddlePak is the perfect partner for days out and about at school, camp, and trips to the beach or pool. The Trunki brand continues its tradition of supporting children’s adventurous minds and spirits while making travel of all kinds easier for the adults following them along. With nine adorable aquatic characters & colors, a child can explore with Chuckles the clown fish (orange), Inky the Octopus (purple), Pinch the Lobster (red), Ribbit the Frog (green), Spike the Blow Fish (yellow), Finn the Shark (grey), Kaito the Whale (black), and don’t forget Bob (blue) and Flo (pink). PaddlePak – your little one can take it anywhere and everywhere they go while you know their favorite things will be safe and dry. After a seemingly unsuccessful appearance on Dragon’s Den, the UK version of Shark Tank, Rob Law proved he had a great idea. Since May 2006 his much loved Ride-on Suite case called Trunki has gone on to sell almost 2 million units in 97 countries. The Trunki brand continues to create innovative and engaging travel products for children. In 2014 Trunki is crossing the pond to the US to introduce these ingenious designs starting with the PaddlePak. Innovative children’s product designer Trunki plunges into the U.S. market this month with their PaddlePak, the backpack for little explorers. 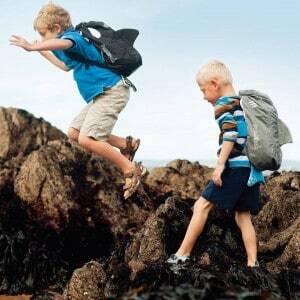 PaddlePak is a water resistant backpack for little explorers. It prevents damp swimming gear leaking through after trips to the pool or beach, and also keeps contents dry on day trips. Made from lightweight and durable material, PaddlePak has a roll top seal that uses the same innovation as adult outdoor bags. It features the patent pending break-away safety buckle, reflective trim, the Trunki grip™ to keep sunglasses or goggles close to hand, and a tail fin that doubles as a functional pocket for small valuables. PaddlePak is the perfect partner for days out, school, camp, and trips to the beach or pool or on any adventure your little explorer will take! 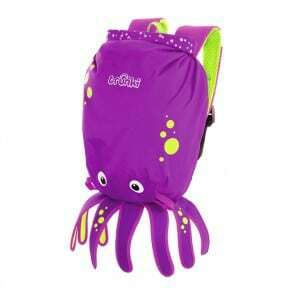 MomMomOnTheGo and her Little One are the proud owners of the Octopus – Inky PaddlePak. We love PaddlePak. PaddelPak is an awesome water resistant backpack that is the perfect size for days out to the beach, camps, and trips to the pool. We can fit everything that my Little One needs right into our PaddlePak. *How it closes with the roll top closure. The age ranking is for ages 2 years old and up. Some age rankings say ages 2 to 6 years old. My 7 year old loves her PaddlePak. It has wonderful colors and tons of character. It is also amazing for keeping the wet gear inside and the back dry. We absolutely love PaddlePak. You can check out more about PaddlePak on their website, Facebook, Twitter, and Instagram. 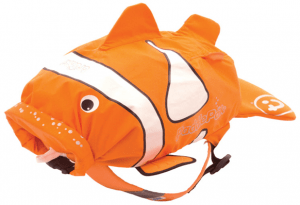 I am excited to announce a giveaway for a Clownfish PaddlePak giveaway. This giveaway is open to residents of the US who are over the age of 18 and where permitted by local laws to enter and win giveaways. Please ensure that you read the full terms and conditions found at the bottom of the entry form. Disclosure: MomMomOnTheGo was provided product for the purpose of conducting this review. As always MomMomOnTheGo only supports companies and products that she loves. My favorite is the Frog-Ribbit. I like the frog, so cute! I like the Paddle Pak Pink-Flo! Ohhh this seems great for my family!